Very happy. They were 9 hours from the time they arrived until they drove out of the driveway. They roofed the whole house. A 30×40 pole building and small barn. I was very happy with the response I had to my original call. They came out and gave an estimate within 3 days. They cleaned up everything. Thank you for the workmanship your crew displayed roofing our garage. You can be proud of them. They did beautifully. When it comes time for any work to be done, we’ll contact you. We recommend you highly. Thank you. Thank you so much for the effort you and your crew made on our behalf during our recent emergency at the Dental Health Center. After you repaired the plumbing problem that caused the flood, your crew worked from early morning until late at night. They repaired and replaced the drywall and then plastered and painted the entire area. We arrived this morning expecting several hours of clean up but the office was spotless. They did a beautiful job! With you permission we will be recommending you to others. The job was completed within the promised time frame & on quote. Job site was left in very good condition. Job looks well done. We were treated well. A good job professionally done. You are the best contractor that we have dealt with! I got your name on a placemat in Rose City. Thank you. Thank you for the awesome new roof I have on my home. I am the envy of the neighborhood. I want to commend you on the quality of your employees. The roofers acted in a professional manner and the job site was left in as good a condition as they arrived. Once again… THANK YOU! Workers were on time and very polite. Went right to work. Worked very long hours and didn’t fool around. Kept area clean. Reasonably priced and excellent job. I have no problem with recommending this company to friends or family and I will call back if I need something else done. Thank you to all the roofers that put a new roof on my whole house, garage and shed. They did a real nice job. Very Professional and explained very clearly what was thought to be the problem and how your staff would correct the situation. Staff was very courteous, professional and knowledgeable as they went about their business. Marlene and I are not used to the high caliber of skilled workers you have and it’s refreshing to see that level of workmanship. Hartman completely replaced 4000-square-foot flat roof on my home and studio. Workers were polite, efficient, covered up any place that might be damaged, were unphased by repairing unexpected damage and cleaned up completely at the end. They immediately repaired a small error and worked well a with cosmetic change we had asked for. Excellent experience. This has been very much a long-distance arrangement – from Adelaide, Australia to Alpena, Michigan. The risk of misunderstandings in something like this are considerable and as far as I can tell everything has gone very smoothly. 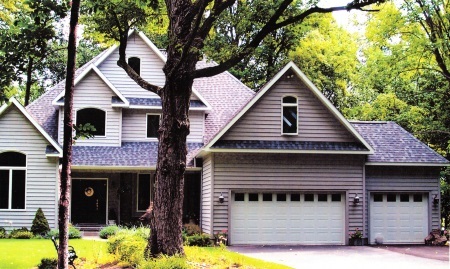 Hartman Roofing has been an absolute delight to deal with in this project. 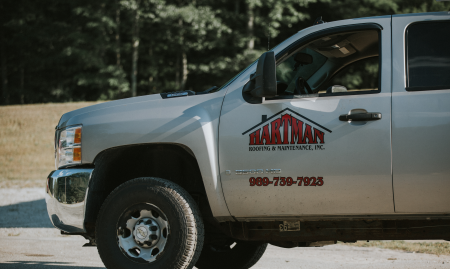 Hartman Roofing and Maintenance, Inc. has earned a reputation for roofing and repair expertise, stellar customer service and attention to detail. In addition to having a strong and successful roofing track record, we are known for a high installation efficiency and quality workmanship when working on new construction, re-roofs or roofing repairs. When you need the world’s best roofers look no further than Hartman Roofing. Our team will walk you through the process of selecting a roof that meets your unique needs, style and budget. From standard shingle roofs to tile roofs and even steel roofs, Hartman Roofing is here to help you with your roofing project. Hartman Roofing & Maintenance, Inc. is fully licensed and insured for our customers’ protection and peace of mind. We look forward to learning how we can assist you on your next commercial or residential roofing or construction project.